Moving is exciting, but it’s also cause for anxiety and tension. Making the arrangements, packing, getting situated in your new home- all take time and effort. The easiest way to assure a successful move is to plan carefully. 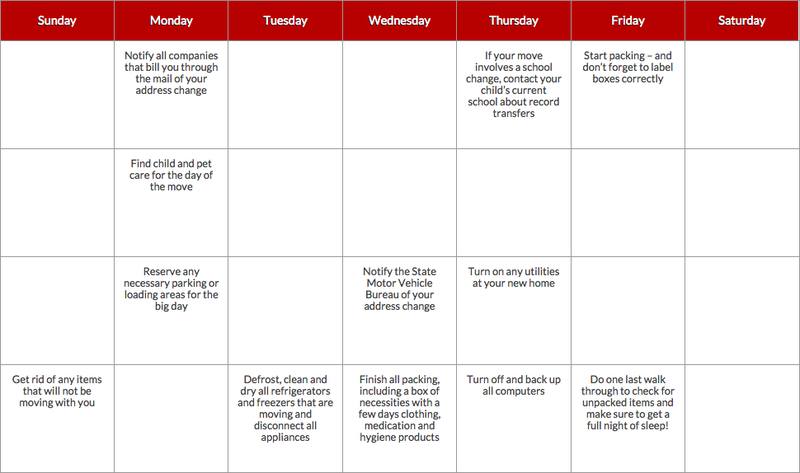 We have designed this sheet to give you helpful hints to make your move go smoothly. There are many people that need to know you are moving; start contacting them early and you’ll be less likely to forget anyone. Mail Delivery – Pick up a supply of change of address cards at the post office or from our office; fill them out early. They won’t be effective until the date you specify. Credit Cards – As you pay your bills, look for the space for change of address, if they’re contacted early enough, you won’t face late charges or extra interest payments later. Utilities – Arrange to have your utilities turned off at the end of your moving day-phone, heat, light, and water as well. Financial Institutions – Talk to your bank about closing accounts, transferring funds, and obtaining safety deposit box, and credit information. Insurance -Let your agent know your moving. Since many homeowners’ policies are paid ahead of time you may be eligible for a refund. Make sure the company has your new address to expedite processing. Pets – Contact your veterinarian concerning your pet’s records. Now is a good time to update vaccinations and discuss any concerns you may have about moving your pet. 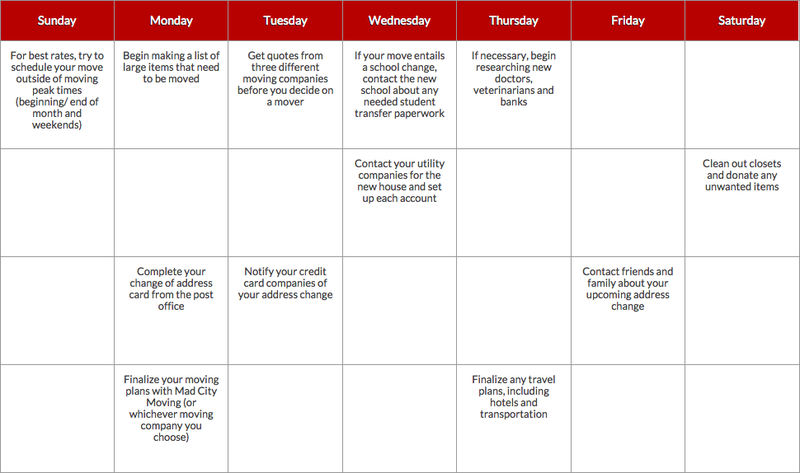 Schedule and confirm your move as soon as you know your desired moving date and time. One or two months of planning are not too much. You shouldn’t move everything you own. It not only costs more money, it takes extra time. Make things easier by eliminating unnecessary items. No matter what it is – that big jar for pennies, the rowing machine you stopped using, the toys the kids have outgrown – don’t move it if you don’t use it. Furniture – This is the most obvious place to start. Get rid of anything that’s worn out, badly damaged, or soon to be replaced. Anything that doesn’t fit in, like custom built shelves or cabinets should probably be left behind. See if the people buying your home would be interested. At the same time, make sure your furniture will fit through doorways and up stairs, better to find out about possible problems before rather than when arriving at your new home. Kitchen Supplies – High up in the cabinets, at the back of the shelves – it’s where you are likely to find things you’ve forgotten about. If you don’t use it, don’t take it. Use your canned goods and frozen foods now. Perishable items are not to be moved by the movers and are not covered if mistakenly moved. Clothes – The rule of thumb is that if you haven’t worn something in 2 years, you probably never will. This doesn’t mean you should get rid of your wedding dress, but there are probably a lot of other clothes you should discard. Give the extras to your local homeless shelter; they’ll put them to good use. Outdoor Equipment – The attic, cellar, and garage, may well contain things you haven’t used in years. If it includes furniture, consider calling in someone who knows antiques before you throw them out. After you finish sorting, take stock of those items you aren’t going to move. If you give them to a local charity be sure to get a receipt and declare a value for tax purposes. If you have many items of decent quality, consider a yard sale. It takes time and effort, but can be profitable. Yard Sale – Get together everything you’re going to sell and make it look as nice as possible. Organize items into categories. Mark all prices clearly and make sure they’re reasonable. On the day of the sale, make sure you have plenty of change on hand, as well as a calculator. Publicize the sale in local papers, through friends, posted flyers and signs. Remember that the purpose of this sale is to get rid of things-bargains sell quickly. Toward the end of the day, reduce prices drastically. If you don’t sell it you’ll have to dispose of it anyway. A good packing job does more to protect your belongings, it can actually make settling into your new home much easier. If you don’t have time to pack, we will be happy to handle it for you. Our professional crews are efficient and careful. If you’re on a limited budget, it makes sense to pack yourself, but devote sufficient time to ensure the items are packed properly and hence protected in transit. If you have some delicate or fragile items that you are nervous about, consider having us pack just those items. You are fully responsible for what you pack. We assume no responsibility for customer packed boxes. Boxes and Containers – We have packing materials suited to all your needs and are available at a nominal charge. Get enough to handle all your belongings, and avoid the trouble of searching for sturdy boxes. Most stores discard their boxes, so trying to find them yourself can be both difficult and frustrating. We can deliver boxes to your home free of charge on any order over $50. All boxes must be taped and closed, no open top boxes. Wrapping Material – We can supply you with unprinted newsprint, which avoids the ink rubbing off onto your possessions. If you decide to use some newspaper, don’t wrap good china or lampshades in it-the ink can cause permanent stains. For items like TVs, DVD players and Computers, pack them in the original boxes whenever possible. This provides extra protection. Labeling – Unmarked boxes are a nightmare. Make sure every room has a marking pen, and write big and bold on all sides. That way you won’t have to open or move boxes around to know what’s in them. Tape-Wide packing tape (not masking tape) is the best. Get rolls with their own dispensers. It makes the job even easier. When you seal a box, make sure the tape extends at least halfway down each side of the box, that way it won’t come loose during the move. Sealable plastic bags – Small plastic bags can be handy to hold knobs, handles, screws, picture hooks, and other easily lost items. Tape them securely to the inside of drawers so you can find them easily once you are in your new home. Trash bags- Every room should have a trash bag. By always having a bag nearby, you won’t be tempted to pack and move things you really should discard. Valuables such as securities, furs, jewelry, coin or stamp collections and legal papers should not go in the moving van. Take those items with you or make other arrangements for their safe shipment. The same goes for items of great sentimental value, like baby pictures and your grandfather’s pocket watch. Keep them with you, just in case. Never pack a box without labeling it. Before you do anything write the room name on all sides. Once you’ve finished packing a box, seal it and write a description of the contents on the outside. When you’ve done it right, the box should weigh no more than 50 pounds and shouldn’t rattle when moved. The sides shouldn’t bulge, and the top must close without caving in. Use paper to fill empty spots, and remove items if the box is too full. The heavier the items the smaller the box should be. The bottom of each box needs a layer of crumpled paper, with additional cushioning layers in the middle and on top. Kitchen – Since this is the busiest room in the house, it is usually left until last. Start with all the things you use rarely, and get them out of the way early. Get together all your dishtowels and potholders; use them for extra padding. We strongly recommend you purchase dish pack boxes specially designed to protect all your fragile items. They are thicker and will not collapse. Appliances should be clean, dry, and disconnected for moving day. This means defrosting and airing freezers and refrigerators contacting Gas Company to disconnect any gas appliances, and plumbers to disconnect water lines. You are responsible for refrigerator/freezer contents, and disconnect and reconnection we assume no responsibility. The Dining Room – Delicate crystal, and china need extra protection. Consider boxing some things up before putting them in proper packing containers. Make sure everything is snug and mark the boxes “Fragile”. Shelving not permanently attached in china cabinets and bookshelves must be removed or brought to our attention. Weight and pendulums must be removed from clocks. We advise you call a clock shop. All weapons must be removed from cabinets, cased and trigger locked. Living/Family Room – Mirrors, ceramics, and framed pictures need to be packed in “special” boxes, which you can obtain from our office. Lamps should be taken apart, bulbs removed, wrapped carefully and placed in proper boxes. Electronic equipment should be disconnected, cords wound and taped to unit and boxed, original, if available. Vertical file cabinets can remain filled if cabinet it metal and no larger than 3 drawer, all lateral and fireproof file cabinets must be emptied. We do move pool tables but they must be disassembled and reassembled by you or a billiard company. We will only be responsible for slate professionally crated and of two or more pieces. We do not move single piece slates. The Bedroom – Clothing can either be folded and packed or hung in the wardrobe closets available at our office. Dresser drawers must be emptied and be sure to remove any liquids, breakables and all loose items. Strip beds completely, you may choose to disassemble and reassemble them yourself, or we can do it for you. If you have a waterbed, completely empty it the day before the move and box it, you would be responsible for any water damage. The Attic/Garage/Outdoors – Before moving anything that’s been in a storage area, make sure it’s clean. Drain garden hoses and empty and wash any plant containers or garden equipment. Gasoline powered equipment such as lawn mowers and snow blowers must be emptied of all fuel and oil prior to your move. If you have a gas grill, we will be happy to take it, but the propane tank must be emptied or transported by you, and the drip pan removed. Plants – Moving plants, whether indoor or outdoor, is tricky business. Most plants are too delicate to survive in a moving van. Shifts in temperature and the lack of water often prove fatal. Potting soil loosens and branches break. Your best bet would be to move them yourself. We cannot be liable for them if moved by us. Pets – Animals can get nervous and upset weeks before the actual move. Their eating and sleeping habits may change. Be aware of this and do what you can to maintain their routine. When all else fails, a little extra love and attention can go a long way toward making your pet feel better. Moving day always seems hectic. There are those last few items that didn’t get packed, those last few calls that need to be made. If you have young children who might not be able to stay out of the movers’ way, see if you can leave them with family, friends, or neighbors. That lets everyone concentrate on the move without worrying about injuries. First thing in the morning, get an empty box labeled “last day”. Also, have some trash bags on hand, as you find items that need discarded, do so. Our Arrival – To ensure our truck can park as close as possible, attempt to reserve stalls or parking area. Please be certain to provide a clean and safe walkway to your home if there is no sidewalk or driveway available. When your crew arrives, take them through the house, while you’re doing this, point out any items not to be moved and those designated “Last Loaded”. Make sure any boxes not to be moved are clearly marked. The first day in a new home can be chaotic; that’s to be expected. Our crew will do their best to keep things running smoothly, but we’ll need your help. Try to keep children occupied with some activity out of the line of traffic. If you have a pet, put it in an isolated room with food, water, and bedding. When the moving truck pulls up to your new home, the crew will be ready to go. You should take the crew on a tour through the house. It’s helpful to put a note on each door – “David’s Bedroom”, ”Study”, etc.- so the boxed you marked so carefully will end up where you belong. Be available to let the movers know exactly where you want things put as they bring them in the house. Be sure to advise if we are to assemble items for you. They’ll be happy to oblige. Once the movers have left, don’t be overwhelmed. Put appropriate items in the bathrooms, paper cups by the sink, and trash bags, in every room. Put light bulbs in the most important fixtures, and hang up your shower curtain. If you have a pet, make sure all doors and windows are closed before you let it explore the house. Although you’ll want to get some basic food supplies right away, there’s no need to start cooking meals immediately. Give yourself a chance to relax, and recognize that you can’t do everything at once. Remember, it takes awhile to settle into a new home. If you first take care of the kitchen, bedrooms, and bathrooms, things will be easier. Now’s the time to try new furniture arrangements, but don’t hang up pictures and mirrors right away. You’ll have holes in your walls if you change your mind later. Take the time to get to know your neighborhood and your neighbors. Slowly but surely, you’ll get all the boxes unpacked and everything put away. Within a few weeks, you’ll have turned your new house into a home. The big decision has finally been made: You’re making the move. Once the initial rush of euphoria wears off, you’re left with the immense task of packing up all of your worldly belongings in an orderly manner to get them to your new place. If you’re wondering how to fit that giant piano into your new place or where those 5 huge boxes of CDs are going to go, you might want to declutter before moving. Consider having a moving sale to get rid of all non-essential belongings before Mad City comes to help you with your move. So, get ready to downsize! 1. Pick a date and advertise. Before you begin assembling items from your home for the sale, it’s important to sit down and strategically pick a date to host your moving sale. Check first with your city or homeowner’s association if you need to get a permit before your schedule your sale. Then, consider scheduling your moving sale to coincide with rummage/garage sale season (usually springtime and end of summer) or when your neighborhood hosts its sale. Once you’ve picked a date, advertise, advertise, advertise! 2. Gather and sort items to sell. It’s time to gather the items you want to sell from your house and take inventory. While our experienced staff at Mad City Moving is more than happy to move large and small items, if you’ve been wondering how you’ll fit all your items in your new place, it might be time to consider selling. Also, this is the perfect opportunity to get rid of items you don’t use that cause extra clutter. Bigger items like pianos, electronics, and furniture you may want to try selling online in order to get the best price for the item. In the meantime, go through each room of your house and box everything that you would like to sell at your sale. Next, review each box with an inventory sheet in hand, and record each item. A general rule is to price items at about 40% of the original retail price. If you have many of one type of item, price them in bulk: For example, one CD for $6, two for $10. Don’t be afraid to advertise and sell some items for a bargain. Ensure ahead of time that you have enough coins and petty cash to make change for buyers. Turn on the radio and play some light and fun music in the background. Keep large and/or sharp objects in designated spots away from any small hands to limit any chance of accidents. Cleanliness is very important. Not only will a clean selling space enhance the perceived value of your items, but it will invite people to stop by. Clean both your garage and yard before the sale and make sure that your items are arranged neatly. Have an extension cord plugged in and available in your garage for buyers who may want to test electronic items before they purchase. Provide snacks such as cookies or cupcakes to enhance the shopping experience. Don’t forget to be an active seller: greet everyone enthusiastically and behave as if you are a small business owner while you run your moving sale. After your successful moving sale, you’ll want to make sure to pick up your flyers and signs soon after the sale is done. Additionally, you must decide what to do with your leftover items. If your main goal is to declutter before you move, you might want to consider donating leftover items to a charity or posting an ad online letting people know they can pick up items for free. Ideally, you won’t have too many things that are left over to dispose of—and even if you do decide to keep some of your things, our movers at Mad City Moving are more than happy to help you out. Now that you know how to have a moving sale, it’s time to go out and do it! Must read packing tips for moving. Proper packing can be the difference between a smooth move and a disastrous one. Here at Mad City Moving we want you to feel secure about your items during your move, so we’ve come up with a few tips to help you pack the right way. Make a list. From packing to changing your address, there is a lot to remember before, during and after a move. With a moving checklist available by clicking here, you can rest assured that you’ve completed all of the necessary steps to make your move, a smooth one! Get organized. Before you even begin packing, go through your home and decide what you want to move and what you don’t. Avoid unnecessary packing by willing or donating unwanted items first. Label, Label, Label! Label all sides of each box with the room it belongs in at your new home. Take it a step further and provide a short description of the box contents on one side. Labeling not only will help make moving day a success, but after the move, your labeling will help tremendously when it comes time to unpack everything. Keep boxes under 50 pounds. Each box should contain a layer of crumpled paper or packing material at the bottom to add some extra cushioning for your items. For boxes that may not be completely full, add additional layers of packing material to keep your items from shifting during the move. Beware of the bulge. If you step back and see that your boxes are bulging or caving in, that is a sign to add or take items out. The heavier your item, the small the box should be. If you have one particularly heavy item, give it its own box, don’t try to over-pack the box and make it too heavy. If you step back and see that your boxes are bulging or caving in, that is a sign to add or take items out. Keep special items with you. Valuable or sentimental items should be kept with you in your personal vehicle if possible. Help everyone avoid surprises. If you have items that might be fragile or very heavy, label the box appropriately. You’ll definitely want the movers to be aware when moving these items. Communicate with your movers. If you have questions, ask! At Mad City Moving, we want your move to be easy. We can help with any advice or questions you might have. All of this may sound like a lot, but if you put in the time to properly pack, your move is sure to be smooth and stress-free. Remember this—If you don’t have the time or need help packing, Mad City Moving can provide professional packing services to help you get the job done. Moving can be stressful: Let Mad City Moving help with your next Madison move. Are packing and labeling boxes causing you to pull out your hair? It might be time to let our professionals help with your move. We will help alleviate much of the stress that comes with moving, while saving you time, energy … and hair. The key to any successful move is organization. We have decades of experience and have the moving process down to a science. We’re pros, and we provide a wide range of moving services, from packaging materials to providing storage to conducting multi-stop moves. You decide what you need, and we’ll be there to help. Whether you are moving your home, office, or perhaps just a piano, rest assured that we’ll help walk you through the entire moving process. We take great pride in our professionalism and ability to protect your belongings, and we provide the quality services that matter most to you. We understand it takes a great deal of trust to hire a moving company, and we do everything we can to maintain that trust and to ensure a smooth, safe move and delivery of your belongings. Don’t expend any more energy on your move than is necessary. Whether you’re moving to a new house, apartment, office, or anywhere else, we can handle your needs safely, professionally, and efficiently. Contact us today for a free moving estimate! When you’re ready to make a move, look no further than Mad City Moving. Our experienced staff, knowledge and resources make us the best choice for your next move. We specialize in “smooth moves” whether you’re moving across the country or just down the block, we want to make your move as easy and stress-free as possible. We offer affordable movers in Madison, Wisconsin and throughout the state. We make sure your moving needs are taken care of here. We take on both residential and commercial moves, regardless of size. We also provide a range of helpful moving services, including temporary storage and packing assistance. Work with the best staff around. At Mad City Moving, we treat your personal belongings as if they were our own. We take the necessary steps to ensure that your belongings are moved safely, without damage. We are proud to provide you with our professional, friendly and dependable staff, who are there to help with any of your moving questions and needs. We strive to provide quality service. Mad City Moving is a certified and licensed moving company recognized by the Small Business Commerce Association, the Better Business Bureau and Angie’s List for our dependable and exceptional services. Mad City Moving provides the efficiency, reliability, and expertise that is important on your big moving day. We guarantee to be there for you on moving day, as scheduled. It’s our goal to offer a professional moving experience to make your move as smooth as possible. Don’t trust just any movers with your belongings! For more information on Mad City Movers contact us today, or request free moving estimate and what we can do for you. Check out what our customers are saying! View our customer testimonials and see for yourself. 1. Is the company properly licensed by the State and Federal Government? Mad City Moving is committed to following all of the State and Federal licensing guidelines and maintains all appropriate licensing documentation including MC, LC, USDOT. 2. Can the company supply a valid insurance policy? Mad City Moving is fully insured for your protection and can provide appropriate documentation of policy. Does the company add fuel surcharges to their final invoice? Mad City Moving will never pass along any fuel surcharges to you – no matter the distance. Does the company stock appropriate moving equipment on their vehicles at no additional charge? Mad City Moving stocks 4-wheelers, 2-wheelers, straps, floor protection, door protection, blankets and shrink wrap and never charges extra for their use. Does the company perform background and drug testing on its moving staff? Mad City Moving is committed to your safety and requires its moving staff to meet appropriate background and drug testing requirements. Is the company easily accessible by phone? Mad City Moving has a live operator answering the phones during all open business hours – no tricky automated attendants! Our office staff will maintain constant communication with our moving staff during the day of your move to ensure there are no missed details. How long will it take to receive your belongings in a long-distance move? While many companies may take days or weeks to deliver your belongings, Mad City Moving delivers within 24–48 hours and provides dedicated service, which means you never need to share our moving vehicles with another customer’s belongings. Does the company have a positive score with the Better Business Bureau? Mad City Moving has received an A+ rating with the BBB, and also is the proud recipient of the 2013 Angie’s List Award, Department of Consumer Trade & Protection (DCTP), Small Business Commerce Association (SBCA) service awards. Does the company implement a minimum moving requirement? Mad City Moving can perform residential moves of any size. Whether you’re moving one item or a large home, we are your choice for quality moving services. Mad City Moving has been in business for over 30 years and has steadily grown to over 25 employees. We maintain a full fleet of moving vehicles and equipment that serve the central and eastern United States. IT’S YOUR MOVE! Moving is exciting, but it’s also cause for anxiety and tension. Making the arrangements, packing, Get great moving tips from our experts in Madison, WI.and getting situated in your new home all require time and effort. The easiest way to assure a successful move is to plan carefully. Make your move a smooth one, after reading our help with moving tips. There are many people that need to know you are moving so if you start contacting them early, you’ll be less likely to forget anyone. A good packing job does more than just protect your belongings – it can actually make settling into your new home much easier. If you don’t have time to pack, we’d be happy to handle it for you. Our professional crews are efficient, careful and willing to help you with moving any way they can. Never pack a box without labeling it. Before you do anything, write the room name on all sides. Once you’ve finished packing a box, seal it and write a description of the contents on the outside. When you’ve done it right, the box should weigh no more than 50 pounds and shouldn’t rattle when moved. The sides shouldn’t bulge, and the top must close without caving in. Use paper to fill empty spots and remove items if the box is too full. The heavier the items the smaller the box should be. The bottom of each box needs a layer of crumpled paper with additional cushioning layers in the middle and on top. First thing in the morning, get an empty box labeled “last day” to use for incidental items that didn’t make it into a box. Have some trash bags on hand. As you find items that need discarded, do so. To ensure our truck can park as close as possible to your home of office, attempt to reserve stalls or a parking area. Please be certain to provide a clean and safe walkway to your home if there is no sidewalk or driveway available. When your crew arrives, take them through the house. While you’re doing this, point out any items not to be moved and those designated “Last Loaded." Make sure any boxes not to be moved are clearly marked. As we get ready to leave after loading, walk through the house one last time to make sure nothing has been left behind. You are ultimately responsible for any items left. When the driver leaves, make sure he has the correct address of your new home as well as a phone number which you can be reached at. Try to keep children occupied with some activity out of the line of traffic. If you have a pet, put it in an isolated room with food, water, and bedding. When the moving truck pulls up to your new home, the crew will be ready to go. You should take the crew on a tour through the house. It’s helpful to put a note on each door-“David’s Bedroom”, ”Study”, etc.- so the boxes you marked so carefully will end up where they belong. Be available to let the movers know exactly where you want things put as they bring them in the house. Be sure to advise if we are to assemble items for you. They’ll be happy to oblige. Put appropriate items in the bathrooms, paper cups by the sink, and trash bags in every room. Put light bulbs in the most important fixtures and hang up your shower curtain. If you have a pet, make sure all doors and windows are closed before you let it explore the house. Although you’ll want to get some basic food supplies right away, there’s no need to start cooking meals immediately. Give yourself a chance to relax and recognize that you can’t do everything at once. Remember, it takes a while to settle into a new home. If you first take care of the kitchen, bedrooms, and bathrooms, things will be easier. Now’s the time to try new furniture arrangements, but don’t hang up pictures and mirrors right away. You’ll have holes in your walls if you change your mind later. Take the time to get to know your neighborhood and your neighbors. Slowly but surely you’ll get all the boxes unpacked and everything put away. As you discard your used boxes, feel free to contact our office to see if we have use for gently used boxes. If so, we would be happy to take them off your hands if they are broken down and flattened. Within a few weeks, you’ll have turned your new house into a home. Remember to enjoy your moving experience as much as possible and take the time to appreciate your new and old home. When you need help with moving, Mad City Moving is here for you with the knowledge and experience to make your next move a smooth one.